When do most potholes form? Most potholes in Ohio form during the colder months of the year. You may have already noticed the holes all over the roads and parking lots this season. After our most recent cold snap and the temperatures quickly increasing, we're beginning to see the devastating effects. 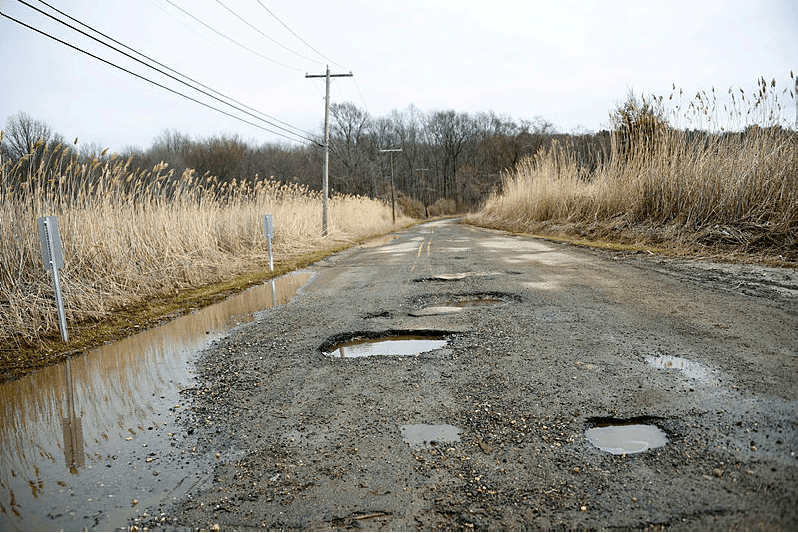 Township road with multiple potholes. Properly winterizing your asphalt property is essential if you want to keep that amazing curbside appeal for the years to come. The best time to inspect and protect your asphalt is during the late summer to early fall, before the first snow. We all want our visitors and customers to arrival safely and depart happy. Remove Debris – Use a stiff bristle long-handed push broom to remove all the dirt from the surface and cracks. Pressure Wash – Apply a gentle cleanser to begin pre-treating your asphalt and let it soak. Use a smooth, sweeping motion while washing the entire area. Make sure to clean any excess oil with non-clumping cat litter. Proper Drainage – One of the most important details is adequate drainage to ensuring long-time pavement performance. Slow drainage can result in freezing within the cracks. Make sure the water is flowing directly into the shoulders of the paved surface. Pothole Patching – Purchase a high quality asphalt patch product. Create firm edges on the sides of the pothole to allow the material to compact easily. Next, compact the material using a wooden post or steel temper. Then, follow the manufacturer's recommendations on the asphalt patch product to complete the patch. Crack Filling – There are several product options for filling cracks in your asphalt. If the crack is less than ¾ of an inch wide it can be filled with a poured or tubed product. Fill the crack and smooth it out. All for the crack to dry at least 24 hours before a second application is applied, if needed. Sealing Application – The general rule is to seal your asphalt every one to three years. When you begin to see the individual stones that make up the asphalt, you know it's time. Sealing the asphalt will not allow oil to penetrate the surface. Less oil equals harder driveway. This is a very easy and cost effective way to protect and prolong your investment. Buy the right materials for the job. Temperatures need to be above 50 degrees during application. Follow the manufacturer's recommendations to complete the sealing process. The use of salt on your asphalt is a controversial issue. There are some that believe the application of rock salt can deteriorate the protection barrier over time and allow water to penetrate the material. There are other concerns as well, including but not limited to; damage to animals paws, corrosion of your vehicle, and damage to plants from runoff getting into the soil surrounding the asphalt. There are other alternatives. One is calcium chloride. These come in either crystals or pellets. This is safe for asphalt surfaces, children, and pets. Use a lightweight plastic shovel after every one to two inches of snow fall to avoid the accumulation of snow and ice on your asphalt. Never use an ice pick or metal shovel as these can cause serious damage. If you expect a high snow fall winter or if you don't think you'll have the time to clear the asphalt make sure you contact a snow removal company early to get on a schedule. Need extra help? Call us! Albatross Asphalt will send a seasoned estimator to look at your asphalt and get it back in order. No reason to worry! We are here to get your blacktop back in shape before the next winter where you will be able to follow the tips above to keep your investment looking great.